0002 - The Ohio Story: "Annie Oakley"
The legend of sharpshooter Annie Oakley from Greenville, Darke County, Ohio. The original manuscript digitized here is located at the Ohio Genealogical Society (OGS) Library in Bellville, Ohio. The Ohio Story Radio Scripts, collection MSS 218 in the OGS Archives, was donated by Jonathan Siedel, son of creator Frank Siedel, on August 12, 1996. 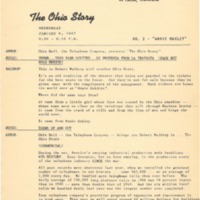 Siedel, Frank, “0002 - The Ohio Story: "Annie Oakley" ,” The Ohio Story Radio Scripts, accessed April 22, 2019, http://ogsarchive.org/items/show/2.